Sothy Kea was a Fulbright student from Cambodia who graduated in 2014. His MA Project was titled, “An Integrated Oral Skills English Pronunciation Course for Cambodian College Students”. 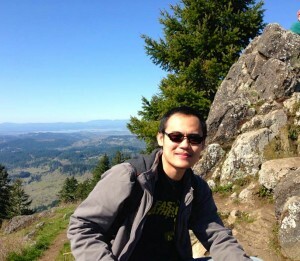 Below he shares his current perspective on what was most useful and memorable from his time in LTS (photo below is at Spencer Butte, Eugene, OR). What did you want to accomplish when you applied to the LTS program? When I first applied to the program, I wished to improve my knowledge about English language teaching methodology, research, linguistics, and curriculum design. Upon program completion, I was hoping to provide assistance in revising curricula, conducting workshops, and teaching in the undergraduate and graduate teacher training programs at my workplace: Institute of Foreign Languages, Royal University of Phnom Penh. What is your teaching or administrative position now? Now I am holding two positions. I am a university lecturer teaching in a Bachelor’s Degree in a TEFL program and a Master’s Degree in TESOL at the Institute of Foreign Languages, Royal University of Phnom Penh. I am also a Language Program Manager at CIA First International School in Phnom Penh, Cambodia. In this position, I am responsible for managing various language programs at the school. At the moment, I am managing the General English Program, and in the future, I will expand this program and develop other language programs. Now that you have returned home, what do you think was most useful from the LTS program? The curriculum of LTS Program is of sound quality. A large number of subjects that I took are both directly and indirectly relevant and useful for my current work. For instance, I am currently teaching the same subject of Academic Writing for Graduate Students in MA in TESOL and teaching Applied Linguistics subject in BA in TEFL Program at my university in which a great deal of knowledge and content of English Grammar and Linguistics Principles and Second Language Acquisition courses are relevant and useful. Plus, working as the Language Program manager, I have to revise the current curriculum and develop new ones. Thus, the Curriculum and Materials Development course and my curriculum design Master’s project are of great help to me. They allow me to analyze the program, effectively identify its problems, and propose feasible solutions. The rest of the subjects in LTS have also indirectly contributed to my understanding about language learning and teaching and better teaching performance. What is one of your favorite memories from your time in Oregon? If I could recall, one of my favorite memories in Oregon is my graduation day. This is one of the best moments of my academic life at UO. It marked the achievement of a milestone and the great result of hard work throughout the program. I was so excited to have such achievement and to see my cohort having the same feeling. It was also fantastic to have the presence of my professors, friends, and relatives on this special occasion. The moment I received the certificate on stage was when I thought to myself that “this is the result of not only over one year of sweat and blood at the UO in the USA but also a whole life of education, and I am thankful to all the people who are part of this”.